First, let me introduce myself. I'm Karen, or Momma or 'Nana depending on who you are. I also tend to blog as Seren Dippity. Amanda has been poking me to post something on the Frickin' Chicken since the beginning but I never remember until whatever it is gets half devoured. And if I can't post a pretty photo, I don't wanna post. Today I was craving banana bread. Browsing recipes I found one that met the criteria, namely I already had all the ingredients on hand. And since The Frickin' Chicken is sorely lacking in the dessert category this will be my first post. 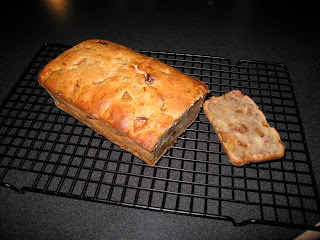 Amanda called me on her way to the store tonight and as we were chatting, I mentioned that I had banana bread cooling. Would you believe, thirty minutes later I hear from my back door "I'm here for my banana bread!" Yep. That's my baby girl. So 9:30 at night we are eating banana bread. This is the first time I've tried this variation and we decided it taste more like baked bread pudding. It is very dense and sweet and cinnamony. Cinnamony is a word. Amanda says she'd add nuts or a crumble coffee cake type topping. I think next time I would add a bit less cinnamon. Amanda took some home for the twins, so tomorrow I'm expecting the real review. Prepare the apples by peeling and coring them. Slice into 1/2 inch pieces. Then preheat a medium skillet over a medium heat. Place the butter and brown sugar in the skillet and heat until it starts to bubble. Then add the apples and cinnamon and cook gently until golden and tender. Stir in the vanilla and remove from the heat and allow to cool. Preheat the oven to 350F. Make sure the rack is in the center of the oven. Then grease and flour your loaf pan. In a large mixing bowl, cream together the butter and sugar until light and fluffy. Add the eggs one at a time and mix well. While slowly mixing add in the baking soda, cinnamon, cloves, nutmeg and salt. Add the flour 1/2 cup at a time mixing well. Add the orange juice and vanilla slowly. Stir in the mashed bananas. Make sure everything is thoroughly mixed together before stirring in the apples you prepared earlier. Pour the finished batter into the loaf pan you prepared earlier. Bake in the middle of the oven on 350F for around 55-60 minutes or until a toothpick inserted into the middle of the loaf comes out clean. Remove from the oven when ready and place on a wire rack to cool for 10-15 minutes. Then remove from the loaf pan and allow to cool for a further 10-15 minutes. This recipe is modified from one I found on a website called Banana Bread Recipes. Yes, A whole website for just banana bread.